If the music of Discipline and, to a lesser degree, Beat had fallen into place relatively easily and naturally, the material making up King Crimson’s third and final album of the 1980s proved to be rather more elusive and difficult to nail down than anyone in the group could have imagined. "We'd all like to think that our better rock groups 'compose’” Bill Bruford observed in 1984 after the release of Three Of A Perfect Pair, “but Crimson sort of scuffles for its music. It's down there somewhere on the rehearsal room floor, and it scrabbles and gets its fingernails dirty." 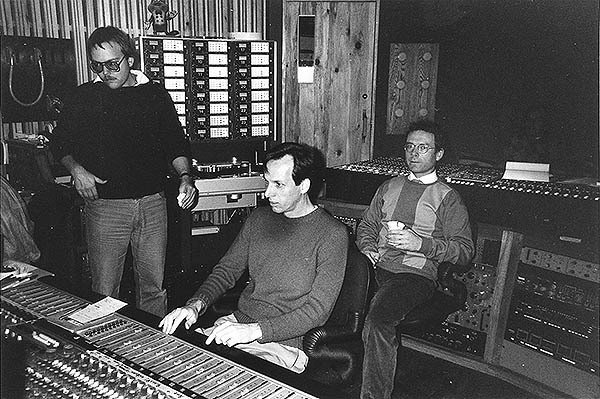 The disagreements between Fripp and Belew over production and mixing that had flared up in the final stages of Beat’s recording in 1982 were largely subsumed when the group hit the road during July through to September. While life on the road can often bring its own tensions, in this instance, it took the heat from that particular argument, requiring everyone to focus performing before enthusiastic crowds in Europe and America. After that tour had finished, and following several months with members engaged elsewhere in their separate projects, in January 1983 they reconvened in Champaign, Illinois for a fortnight to sift through ideas, riffs, improvs and potential songs. Four months later in May they regrouped once again, this time in Devon, to resume work on what would be the third consecutive album by this line-up. Although this initial session was relatively productive, yielding Industry and Dig Me, when they decamped up to London’s Marcus Studios later in the month, nothing particularly coalesced. Why was this? “There was no one in charge,” is Robert Fripp’s quick answer to that particular question, adding that gradually deteriorating relationships and a division of royalty income that was in theory equitable but failed to encourage those doing most of the compositional work, the process of making an album wasn’t likely to get on track. Proving to be the most recalcitrant of all King Crimson records to make, and certainly the longest, it wasn’t until after Fripp and Belew did some writing together in September that the bulk of the album finally fell into place at Bearsville Studios in Woodstock during November and December. Despite the challenges encountered in the recording, the finished album contains some of the most enduring and popular items in the KC setlist. With the title track and Sleepless revived revived in the ‘90s and beyond. Three Of A Perfect Pair unites the pointillist house-style the band had been developing since Discipline and Belew's finely-honed pop sensibilities in a near-effortless combination. Stemming from a Belew riff which the band had thrown around in concert prior to the recording of Beat, the tune has a deft lightness of touch that it's impossible not to be charmed and intrigued at the same time. "The title came from nowhere," says Belew. "It popped into my mind and was quickly acknowledged by the boys as an apt title for the eighties trilogy." Sleepless began life as a Tony Levin riff back in Devon and although the band jammed around it, nothing stuck at the time. "When we reconvened in Woodstock,I was in a different mood with my playing, and I did the opening as a slapping part instead of using a pick, as well as playing it much faster.It just took off to a different place then, for no reason; it was just very much in the air," recalls Levin. Bruford remembers that while at Bearsville, Belew had a lot of trouble getting to sleep. "He maintained that the house was haunted and that he was having some very strange dreams but you do when you're up against a deadline and you've got lyrics to write. Adrian earned every penny for those words." The excessive aspect of the band manifested itself in the semi-improvised tone poems, Industry and No Warning. "It was suggested at one point that we go into the studio and really not pay attention to each other, but still try and go in the same direction, if you know what I mean," says Belew. "That's how a lot of the industrial-sounding stuff came about, by just going in there and trying to make an 'almighty noise,' as Robert calls it." Dig Me questions preconceptions about what a ‘song’ might consist of, pushing Crimson’s tradition of combing opposite elements almost to the limit. Belew recalls that the song's origins lay in the attempts to come up with a different style. "I told the guys I wanted to lay down this very awkward guitar part and then have them play to it, but in a way that would sound like we're really not playing together as often as we are. The song sounds like it's falling apart." Consisting of songs with hook-laden choruses, stomping pop tunes, instrumentals brimming with baffling metrical complexity, pensive improvisation and, in the shape of the 12” remix of Sleepless, a potential disco hit, Three Of A Perfect Pair stands as one of the most eclectic studio albums in the Crimson canon. Released in March 1984 it received a predictably mixed reaction from the press of the day although even its detractors praised it for avoiding what John Gill in Time Out termed the "creative dotage,” the fate of some of King Crimson’s contemporaries. Reviewing the record for More Music, Pete Ravens commented,"You won't be disappointed. Confused, scattered, and ultimately disorientated but not disappointed. King Crimson has become a constantly challenging institution. How many other bands can boast this?" With no plans in place for the group beyond the tours of Japan, America and Canada, when they played their final show in July 1984, King Crimson simply ceased to be. It would be another ten years before the band reconvened to unleash THRAK.